Remember that Tsunami in Japan in March 2011? Those faces of devastation and despair? Some of those faces are smiling now. 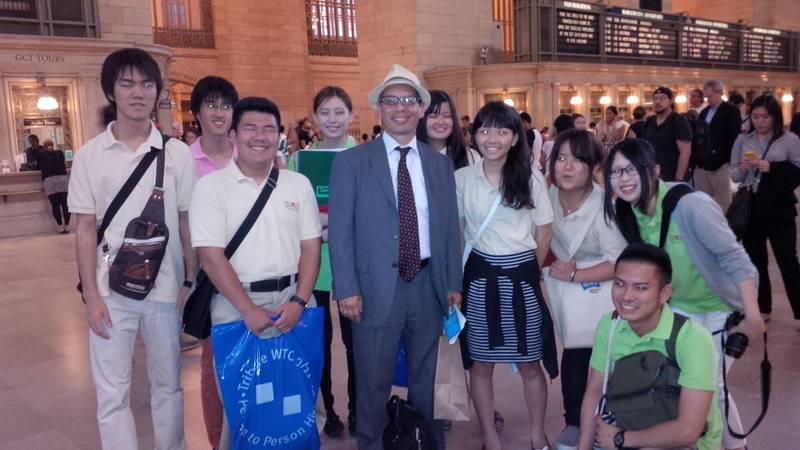 I was walking the food stalls at Grand Central Station when a group with bright green polo shirts caught my eye. “Beyond Tomorrow“. Could it be the logo I had helped create for the educational opportunity NGO of the same name from Japan that would help victims of the Tsunami? I heard the Japanese and saw the ages of the kids – yup, it was them! According to their web site: “On March 11, 2011, Japan was struck by a disaster of unprecedented scale – devastation on three levels: an earthquake, a tsunami, and nuclear plant meltdowns. Not only has this disaster claimed the lives of thousands, it has caused unimaginable grief for countless others who have lost everything they owned. And here they were in NYC! What a great reunion. I chatted with Executive Director and Member of the Board, Minami Tsubouchi, who worked on the NGO with me from the very early days. These kids are seeing the world beyond Fukushima and have a life beyond tomorrow thanks to the many generous donations and the support from so many people around the world, especially from here in the US.